Visually inspiring a new generation of princesses. an Alliance Films release. Photo Credit: Jan Thijs. This version of Snow White and the Seven Dwarfs has been updated. The humour has been updated to try and entice an older audience; the characters have been updated to be all inclusive; but primarily, director Tarsem Singh has been brought in to update the entire presentation. He narrowly avoided an entire song-and-dance production but provided an epically beautiful landscape for the legend to unfold on. The best update was the character of Snow White (Lily Collins). She’s a bit timid at first but that’s just because she has never been outside. Once she gets outside, she’s going to rescue a prince, save herself, take care of some short-statured adults, and generally rule the roost. She’s not your average princess. an Alliance Films release. Photo Credit: Matthew Rolston. Prince Alcott (Armie Hammer) is not your average prince either. He does come close; he is handsome, and extremely vain, and unfortunately has more instincts on fashion than self-preservation. The prince and his side-kick are given the funniest lines (outside of Roberts’ Queen) most of which involve how girls go crazy for a prince and a very clever line defining the various levels of crazy. Snow White doesn’t need the prince at all and I have never been more optimistic about the future of young female heroines. There was of course a romance element, which I probably could have done without, but it did fit in its place. The “colourful” characters should have been kept still and quiet, and they should have found a way to speed the story up. 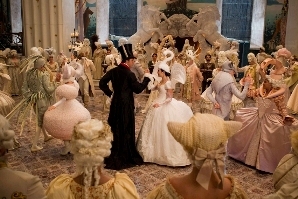 Lily Collins stars in MIRROR MIRROR, an Alliance Films release. “Mirror Mirror” has the story and production that could inspire pre-teen and teenage girls to get into filmmaking. And if not, it should at least inspire them to become powerful, independent and competent princesses. Which is three adjectives better than princesses of previous generations.